Image description: Black and white photo showing a young white woman with long brown hair. She is wearing eyeglasses, dangly earrings, and a scarf around her neck. She is standing behind a tile wall. People with disabilities are not often encouraged to participate in local politics. Not only are we not encouraged, but we are sometimes actively discouraged. There is a plethora of programs to help diverse groups of people participate in local and federal levels of politics, but very few of them are open to providing the types of accommodations that someone who is DeafBlind might need. I applied to DeafBlind Citizens in Action’s Young Adult program two days before the deadline. I had gotten an email about it from my local National Federation for the Blind chapter, an organization I’m only peripherally involved with. I’ve been a staunch supporter of various social justice issues throughout my life. I was a member of the Amnesty International chapter at my high school and the environmental club. In college, I was a member of the Gay Straight Alliance and the Social Work in Real Life group because I enjoyed volunteering. However, I never had the opportunity to really dive into the political sphere. Most of the groups I was involved in partook in marches and protests—to things I’ve never been comfortable with as a blind (or DeafBlind) person. During the 2016 presidential campaign, I had considered volunteering for Hillary Clinton locally, but shied away after being laughed at, and hearing a variety of comments about a DeafBlind person not having a lot to contribute. When I received my acceptance letter from DBCA, I really did not know what to expect from the program. My overall goal was to go in and learn about the various levels of government—something I had somehow missed during social studies in high school. I was also aware that we were going to have the opportunity to speak with local legislators. What I got out of the experience was far more valuable. Though I have been legally blind for over a decade, my hearing loss did not begin until last year. At which point I dove into learning ASL and furthering my skills in braille. I also needed to entirely relearn my mobility skills, adjusting for my new hearing. DBCA was going to be full of firsts. First time working with interpreters for college level lectures, for using Pro-Tactile communication (a method used to make audio and visual information tactile), for using braille more heavily (audio got me through college), for communicating in person with other DeafBlind people, and the first time flying since the onset of my hearing loss. It was also the perfect program for me. It gave me everything I wanted to learn. I was instructed on the difference between regulators and legislatures. I was able to meet members of the Department of Justice, Department of Education, Department of Transportation, and the Federal Communication Commission. Even better? My voice and experience mattered. As a person with a disability slogging through endless rejections from potential employers, weird comments from editors, and general disregard for my opinion, this experience was a breath of fresh air. Someone at the FCC cared that there were rampant accessibility problems. The Department of Education representative was responsible for the special education department—and she cared about our opinions on education. She cared about the fact that schools across the country are using tech that is inaccessible to students with disabilities. That this inaccessibility was creating a barrier to access STEM education. Further, I could see exactly how my own expertise in science and technology was not only important, but rare. This specialty allowed me to walk into the offices of my local legislators and tell them what my community needed, and I could bring up unique opinions using my background. I was also emboldened to take lead and speak on a tech panel that was a collaboration between several blindness agencies, DBCA, and Verizon. I regularly suffer from low self-esteem, and as cliched as it is, I am my own worst critic. It’s hard for me to look at my accomplishments and see progress. Mostly all I can see is a failure to find gainful employment, which has in turn generated even lower self-esteem. To participate in politics, you need to first believe that your voice matters. That your experience is not only relevant, but critical to getting important rules and regulations passed. It also prevents someone from recognizing that they deserve legislation that can improve his or her life. DBCA rekindled my love of getting involved in my own local community because it created a path that was fully accessible to me as a DeafBlind young woman. I know now what full accessibility looks like, and I can turn around and participate in my local level politics. This past week I even picked up the phone to call my state’s Secretary of State to voice my opinion about a local issue. Something I’ve had a great deal of anxiety doing, as I have difficulty hearing on the phone. Entering the political sphere can be daunting for anyone. But how much more so for young adults who are DeafBlind and have unique communication needs. It’s difficult to get involved when we get stuck advocating for our communication needs on top of learning how to get involved. DBCA took a level of complexity out of the equation, leaving more room for learning. I now have the confidence to not only advocate for my communication needs, but also to get involved on a local level because I’m not a complete beginner anymore. I look forward to seeing what I can contribute to our government, and in future campaigns. It is my hope that more young people with disabilities will get involved. There is so much need for advocacy, and legislatures want to hear your opinions. Most people in government are there to serve the country—make their jobs a little easier and voice your opinion. 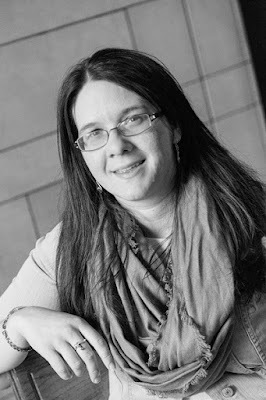 Kit Englard is a freelance writer who specializes in assistive technology. She is the founder of Femme de Chem, which works to expand opportunities for people with disabilities in STEM fields. She uploads videos and articles weekly. Follow her on twitter (@mathnskating) and on Facebook (Femme de Chem). You can support her and her work at patreon, or leave a tip! 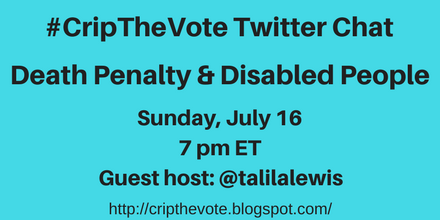 Graphic with an aqua blue background and text in black that reads: "#CripTheVote Twitter Chat, Death Penalty & Disabled People, Sunday, July 16, 7 pm ET, Guest host: @talilalewis, http://cripthevote.blogspot.com/"
We are thrilled to have TL Lewis as our guest host for another #CripTheVote chat this summer. This discussion on July 16 will focus on the death penalty and disabled people. Please join us! Information on how to participate and the chat’s questions below. Recognized as a White House Champion of Change and one of Pacific Standard Magazine's Top 30 Thinkers Under 30, Talila engineers & leads innovative and intersectional social justice campaigns that illuminate and address grave injustices within our legal system that have gone unaddressed for decades. Talila's advocacy primarily focuses on creating equal access to the legal system for people with disabilities & individuals who are Deaf, DeafBlind, DeafDisabled & Hard of Hearing. As one of the only people in the world working on deaf wrongful conviction cases, Talila regularly presents at universities; testifies before legislative & regulatory bodies; and trains members of congress, attorneys, and law enforcement about this and other disability-related topics. As the creator of the only national deaf prisoner database, Talila advocates with & for hundreds of deaf defendants and incarcerated & returned individuals. Talila serves as the volunteer director for Helping Educate to Advance the Rights of Deaf communities (HEARD), an all-volunteer nonprofit organization that works to correct & prevent deaf wrongful convictions; end abuse of incarcerated people with disabilities; decrease recidivism for deaf and returning individuals; ​and increase representation of disabled people in professions that can combat mass incarceration. Talila, who just completed a third and final year as a visiting professor at Rochester Institute of Technology, is a recent graduate of American University Washington College of Law and has received awards from numerous universities, the American Bar Association, the American Association for People with Disabilities, Congresswoman Eleanor Holmes Norton, the Nation Institute, National Black Deaf Advocates and EBONY magazine, among others. Welcome to the #CripTheVote chat looking at the death penalty and disabled people. We are pleased to have guest host @talilalewis with us today! 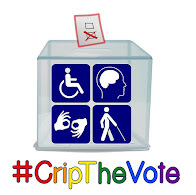 Remember to use the #CripTheVote hashtag when you tweet. The hour has flown by! Sadly, this concludes the #CripTheVote chat on the death penalty. Thank you for joining us.